The Automatic Telescope for Optical Monitoring - is a robotic 75 cm telescope serving as an optical monitor of variable gamma-ray sources, as a monitor of potential H.E.S.S. targets, and as a instrument to measure atmospheric transmission. ATOM provided optical data during the observations of the the BL Lac object RGB J0152+017. The left image shows the telescope while in a dome in Germany, the right image after installation on the H.E.S.S. site in Namibia. 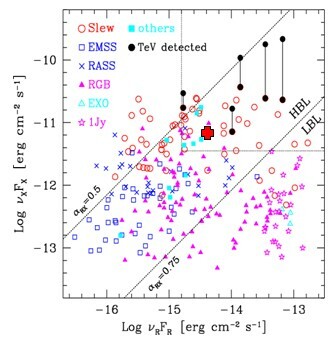 The active galaxy RGB J0152+017, at a redshift z=0.080, was selected as target for H.E.S.S. observations because of its relative high radio and X-ray flux, characteristic for TeV-emitting active galaxies (Fig. 1). "RGB" denotes the Rosat/Green Bank catalog of objects detected in coincidence in Rosat X-ray data and in the Green Bank 5 GHz radio catalog. H.E.S.S. observed the source from Oct 30 to Nov 14, 2007 for a total of ~15 h live time. A preliminary on-site analysis showed a significant gamma-ray excess from the direction of RGB J0152+017, which was communicated by an Astronomer's Telegram, alerting other observatories. Follow-up observations were performed with the ATOM optical telescope on the H.E.S.S. site, with the Nancay radio telescope, and by triggering target-of-opportunity observations with the Swift and RXTE X-ray instruments. The offline analysis of H.E.S.S. data confirmed the detection (Fig. 2); the source has a flux of about 2% of the flux from the Crab nebula and a spectrum with photon index of approximately 3. Modeling of the wide-band emission spectra of active galaxies is complicated due to the high variability of these objects, which on the one hand requires simultaneous observation in the different wavelength regimes of interest, and which on the other hand do not permit the use of steady-state solutions. In case of RGB J0152+01, virtually simultaneous data was recorded in the radio, optical, X-ray and gamma-ray domains. In none of these, significant variability is seen, implying that the source was in a steady, non-flaring state. The measured energy output across the electronmagnetic spectrum is shown in Fig. 3. It can be interpreted in a SSC model (Katarzynski et al. 2001), where a rapidly moving compact blob of high-energy electrons inside the AGN jet emits synchrotron radiation and creates, by upscattering of sychrotron quanta by electrons, gamma rays, forming a double-humped spectrum. Optical frequencies receive a dominant contribution of thermal radiation from the host galaxy; an additional extended sychrotron source needs to be postulated to explain the radio data. Fig. 1: X-ray flux versus radio flux for active galaxies, from Costamante and Ghisellini (2002). Candidate VHE gamma-ray emitters are objects in the top right corner, combining high radio and X-ray flux. 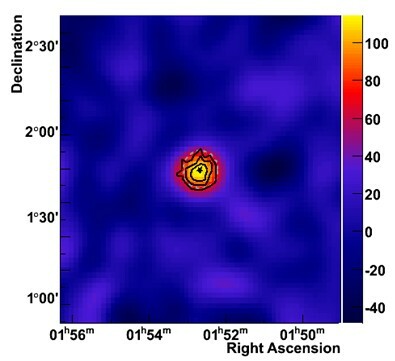 Objects detected in VHE gamma rays are shown by the black circles. RGB J0152+017 is shown as a red cross. Fig. 2: Smoothed gamma-ray sky map of the region around RGB J0152+017; the color scale gives the gamma-ray flux, the black contours the 3, 4, 5 sigma significance levels. The star denotes the position of RGB J0152+017. The observed excess is consistent with a point source, the width of the distribution being compatible with the angular resolution of the instrument, has a significance of 6.6 standard deviations and the position is within the 20" errors consistent with the location of RGB J0152+017. Fig. 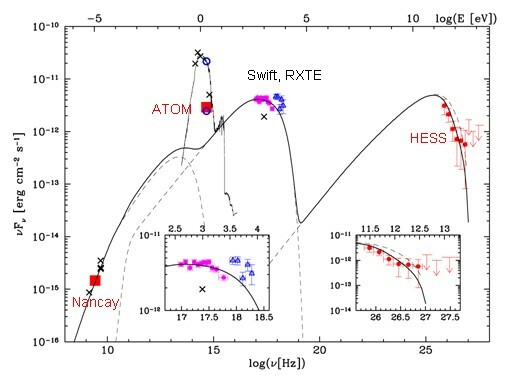 3: Spectral energy distribution of radiation from RGB J0152+017; colored symbols refer to quasi-simultaneous observations by H.E.S.S., by the Swift and RXTE X-ray satellites, by the ATOM optical telescope and the Nancay radio telescope. The insets give expanded views of the X-ray and gamma-ray spectra. The solid line represents an SSC model where X-rays and gamma rays represent synchrotron radiation and inverse Compton scattering of electrons confined in a volume of about 1015 cm, moving at highly relativistic speed. An additional syncrotron component from a more extended region is added to explain the radio flux.